Holy hell was this week’s issue a twist to INJUSTICE. Superman takes charge as the battle rages on between all sides. It’s an all-out superhero war on Earth and no one is spared from a duty to their side. Superman dominated the issue with his plans finally being carried out. Tom Taylor spread the script evenly, giving all sides of the troops a fair share of the panels as well. Blending so many characters and all their spare missions is a challenge that the scripting supports well. Taylor not only helps characters communicate easily with each other but also adds personal connections into the story. 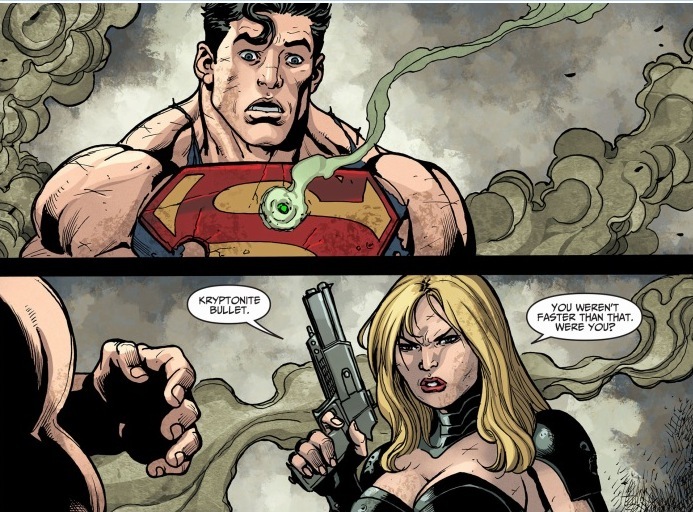 Canary, once a Justice League member, knows Superman like family and their relationship is highly focused on in the issue. Not only were personal relationships put to the test but that of the groups as well. The Corps strengths were highlighted in the clever scripting, keeping their trump card hidden only until the very last minute of need. Tom Denerick takes charge of the artwork this issue with a more cartooned approach to some of his panels. 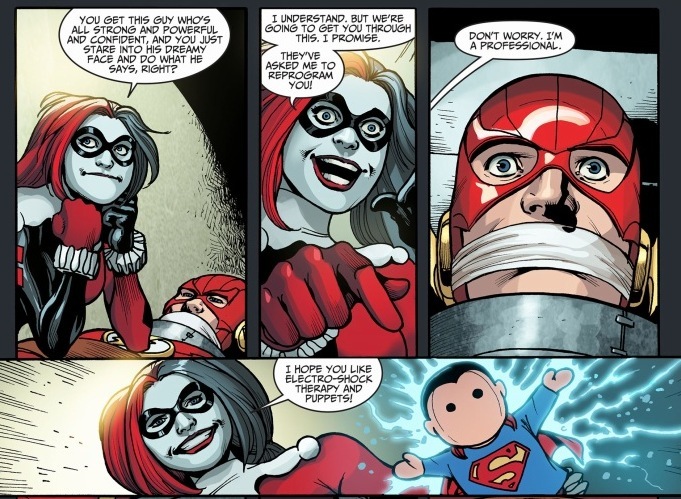 I found that characters such as Harley had that comical appearance while Superman and Canary had a more buff facade. Rex Lokus has injected more colors of than the rainbow has into each page. The vibrant, bright artwork stands out for itself, drawing readers eyes left, right and center to see everything that is happening. The dramatic action scenes are captured neatly and cleanly with the structure of each page carefully planned out for maximum excitement impact. I always love the scripting of the characters. Week to week, each character really does stay true to their form with language tailored to each person. Jumping from a lunatic clown to a Yellow Lantern can be really tricky to keep track of. Some people can only seem to write one character well and then that is their niche, but Taylor provides the wide range of character personalities with his own flare. He brings classics together with newer characters and adds a whole new dynamic to the DC universal stage. 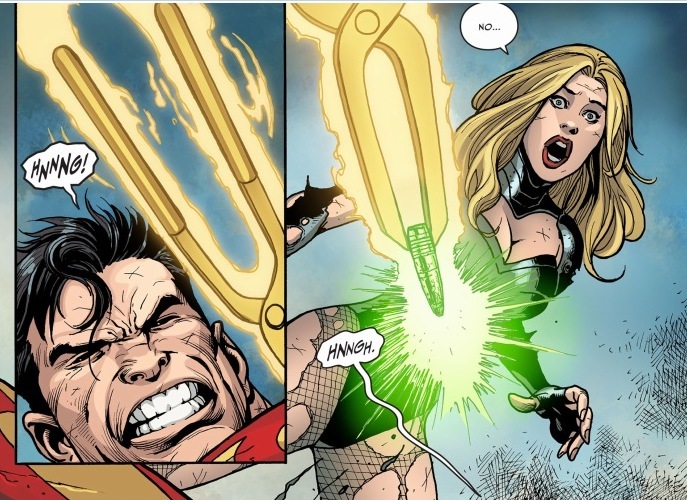 This definitely gives INJUSTICE the edge over some of the other “combination” team comics. I also found the extreme twists well depicted. 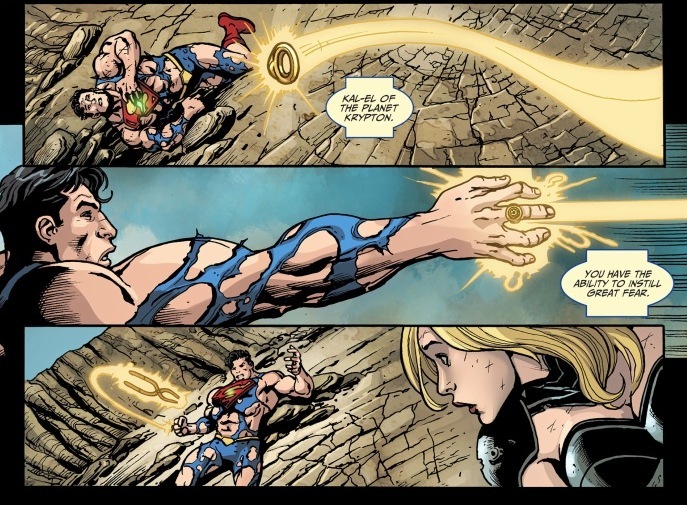 I knew Canary would eventually be put into the line of fire, but to see other powers intervene was a variation executed perfectly in the Yellow Ring. The battle of the Lantern Corps is definitely one sided. 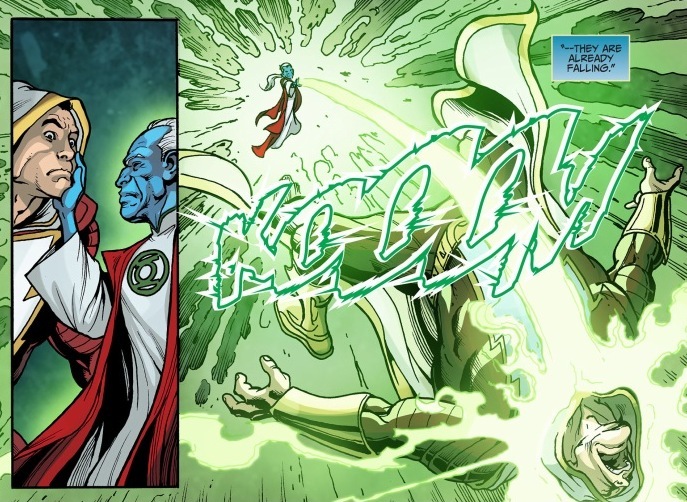 It seems that the Green Lanterns just come in with a magic wave of destruction and everything is disintegrated. I would have liked there to have been a bit more of a struggle and that in turn, would have intensified the situation. The artwork is rather inconsistent going from cartoon like to a sketchy, dirt laden appearance. I’m not a fan of the overly muscular attributes and I actually prefer the thicker contracted line work of the cartoon style. It complements the bold colors well and really pops off the page while keeping the characters to a true form. 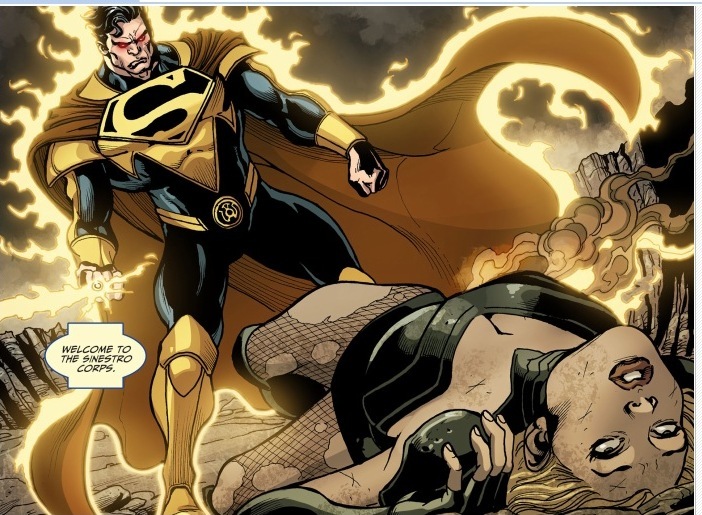 This week’s INJUSTICE delivers a shocking punch to the core of the story arc. The end of the year is coming and the question everyone now is asking is, who will be the next to go under Superman’s almighty fear.